You and your spouse own your home and you would like to sell it. However, your spouse is currently unable to sign the sales contract. This is because he is either out of the country in some exotic far-away-place where fax and overnight delivery is unavailable, or because he is physically and mentally unable to make decisions or sign legal documents. There is a document called a “power of attorney”, whereby your spouse signs a legal document authorizing you to act on his/her behalf. The giver of the power of attorney is called the Principal. The receiver is generally called the “attorney in fact”. The latter is given the right to act on behalf of the principal, for the purposes and functions spelled out in the legal document. Note: the power given to the attorney in fact may be very broad, unless conditions and limitations are spelled out in the legal document. 1. General — here, the principal authorizes the attorney in fact to take any and all actions as if the principal was taking them him or self. This is also known as a Durable Power of Attorney. Keep in mind that your own State law may have specific requirements in order to sell real property by way of a Power of Attorney. Some states will not permit real estate to be conveyed by such a General power of attorney. 2. Specific — here, the principal gives specific information and instructions to the attorney in fact. For example, sell my house located at 123 ABC Street; or write a $1,000 check to my insurance company from my bank account. The specific instructions are contained in the legal document, and the attorney in fact has no authority to exceed those instructions. If you plan to sell your house, and find yourself in the situation where one party in title will not be available to sign contracts, deeds or other legal documents pertaining to the sale, it is best to have your attorney draw up a Power of Attorney that meets your needs, as well as the legal requirements in the State where your property is located. The principal may want to put a time limitation on the Power — for example one or two months. However, with a durable power of attorney, the principal normally does not place any such limitations. The purpose of a durable Power is to assure that in the event the Principal becomes incapacitated, his attorney in fact will be able to step in without having to go to Court. Let’s go back to our example. If your spouse knows in advance that he/she will be out of the country when you want to sell your house, have the Power of Attorney executed before the trip starts — and give a long lead time before the Power expires. Keep in mind that although we now rely heavily on scanned documents, in many instances the person relying on the power of attorney must have the original with the notary seal clearly shown. However, if you do not have a Power of Attorney and your spouse suddenly has a stroke — or is otherwise unable to comprehend and sign legal documents, then you will have to go to your local Court and seek permission to become the Conservator of the Estate of your spouse. This is a relatively easy (but potentially time consuming and expensive) process. The Courts, however, want to make absolutely sure you are sincere in your efforts to represent your spouse and that your spouse is, in fact, not able to sign any legal documents. There are, unfortunately, too many cases where someone– including a relative–convinced another party to sign a general power of attorney, which enabled that “attorney in fact” to steal the house or break the bank. Speaking of banks, if you will need to use a power of attorney to get information or money from a bank, check with the bank first. 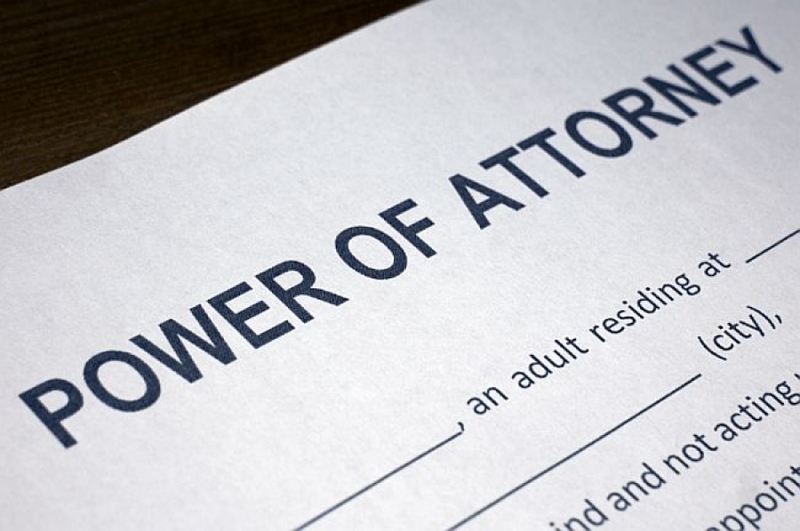 Many banks have their own power of attorney forms they insist on being used. Preventive law is the key; consider obtaining a durable power of attorney now, while you both are in good health. Each spouse should sign a separate document, making the other spouse the attorney in fact. However, an alternative attorney in fact should also be designated, just in case both of you become incapacitated at the same time. Your local attorney should be consulted to make sure that you are using the proper forms and that you fully understand the consequences of your actions. A Power of Attorney gives someone else the right to sell your house, and you want to make sure that you are not giving away the store.